The Fates have conspired to get me to join Joel in delving into the dark arts of car modelling! I found this sorry specimen in our Oxfam book bank (you'd be surprised what else we find in there beyond books!...). It's not fit for sale in our shop, but I can never bear to a kit go in the bin - plus, someone's donated it to Oxfam to try to raise money to help people, so I decided to see if I could make something of it and I reached for my wallet. A few pieces are ripped off the sprues, but I think everything's there. I haven't built a car model in many years, so this should make for an interesting busman's holiday from my usual diet of military aircraft, as well as offering a test-bed to try some finishing techniques I don't normally use. The wonderful deep shine that auto modellers achieve has always fascinated me, so it'll be fun to try get something approaching it. Plus, this is a re-box of a classic Airfix 1960s car kit (1966, I think), so there are no metal plated parts - so I want to see if I can produce some passable chrome trim. I'm not promising a quick build, or even regular updates; this will be a back-burner project while I work on the aircraft book I'm signed up for. In fact, this could be something of a "sanity-saver" project! So, if you see me putting in a load of work on the Roadster, you can probably assume I really need a break from kits with swastikas on their tails! It seems Joel the Pied Piper has lured another - I have been wooed to the auto model world but will be doing a two wheeled subject rather than four . Spent some time with MG's . My older sister had an MGB GT. If you want to make it accurate be certain to include the the manual choke T handle hanging limp from the dash because of a broken cable - dim Lucas headlamps - an oil puddle underneath - if it is summer have some steam emitting from the radiator. Lastly be sure to include a broken Leyland electric overdrive because of someone reversing the car without disengaging the overdrive first . Don't ask me how I know ! PS - loved the car anyway- greatest gearbox ever - thankfully your kit is of the proper model and not the horrendous 5 mph impact " black bumper" model that showed up here in the USA with it's backside up in the air via longer spring shackles to meet new minimum bumper heights. I've recently started driving a modern car for a friend after not having been behind the wheel for 20 years. In those days I had an old Morris Traveller, so I thought I'd better have a refresher lesson for safety's sake. The instructor wondered why I took so long to start the car and laughed when I said I was looking for the choke. Modern gearboxes take a bit of getting used to too after my Moggy. Rowan glad and pleasantly surprised to see you here! The kit is definitely very attractive and I will follow your progress - although you said isn't gonna be a regular one - but you might get drafted once you start it! The Gods have spoken for sure. I'd give you the biggest hug you ever got for doing this build!! Aoshima has listed for release a 1/24 scale 1967 MGB, and I'm in for a min of two, most likely more. Why you ask? Because it's my all time favorite British Sports car. I owned a Red 1967 B, converted it into a semi street legal SCCA E production racer, that I ran in time trials at Bridgehampton Race Circuit, before going into Enduro Karting. And I'm proud to say that on more then one occasion I placed her in front of a few full race Elva Couriers. Just loved that car. Unlike Richard's fond memories, my manual choke cable never hung, the gearbox with it's non-syncro 1st gear worked flawlessly, and never, ever, did I allow her to have an oil leak. But Richard also loved the B, as you just couldn't help yourself. I never had an electric overdrive as it just wasn't Britsh. The 1970 B had those hideous black rubber inserts into the bumpers, I believe they were required by the safety laws then in the US, as well as raising the height of the of the car so the bumper height was legal. God, were those cars just PLAIN UGLY !! The engine was to me just a thing of beauty, and the little shall we say illegal tweaks, just sweetened the power curve. The song of the Abarth exhaust was music to my ears, and the Narty wood wheel equaled the best that any Italian street car had if you kept it polished. To this day I've never revealed just who turned that magic Cam shaft, or made the custom valves & springs. And for street driving, I always wore my real British Driving Gloves. So Rowan, I'll be following your build with a smile on my lips, and a ton of fond memories. For the life of me I can't ever remember seeing a proper B painted in Canary Bright Yellow. Please, do her proud, and paint her BRG (British Racing Green). Thank you all so much for your encouragement! Building this will be a bit of a leap into the unknown for me, so I really appreciate it. As regards the colour, I totally agree; that intense yellow on the boxtop looks very "un-Sixties" to my eyes too. I was only about 7 years old when Airfix released this kit, but I don't remember seeing any bright yellow British cars on the road until more like the '70s - unless they'd fallen into the hands of the local hippies (and then they were crudely brush-painted and there was usually a lot of extra psychedelic artwork added for good measure). I won't even try to predict when I'll be able to show any progress shots. I'm just approaching the busiest time of year in my Oxfam bookshop - plus, I do need to keep ploughing ahead with my Luftwaffe builds - but I won't let this project fall by the wayside. To be truthful, my B was Red with a black interior and a black convertible top. Why Red over BRG you may ask? the answer was simply that the only MG dealer within the county we lived, Trencher Motors (long gone), didn't have a BRG MGB. Can you believe that. they had one Red with Red leather seats and a Red convertible top. Looked like a Pimp's car to me. But they also had a Red car with a Black interior, and a Black convertible top. No rush on the build nor posts. But I'll be here for each one of them. Very nice choice and proposal, good luck on your build Rowan! Really curious on how you'll bring it out. #1 was a MGB, what was quite hard to get in West-Berlin in a proper condition and for a reasonable price. #2 was a BL Spitfire Mk. IV ( ) that I finally purchased. And for sure it costs me a lot of money and repair-time in the following years. Really - You cannot have too many Spitfires, especially for spare parts! Leakeges, Problems with the engine, the carburators, the gearbox, the hydraulic system ,the axles etc. and a lot of rust issues. Two times repainted; metallic green and later on a white/black sheme. So most of the money was spent for keeping it in a regular driving condition - far away from modifications like Joel did on his MG.
Wow, a Triumph Spitfire. I do remember them well including the Triumph TR-4, 4A, and 250s. 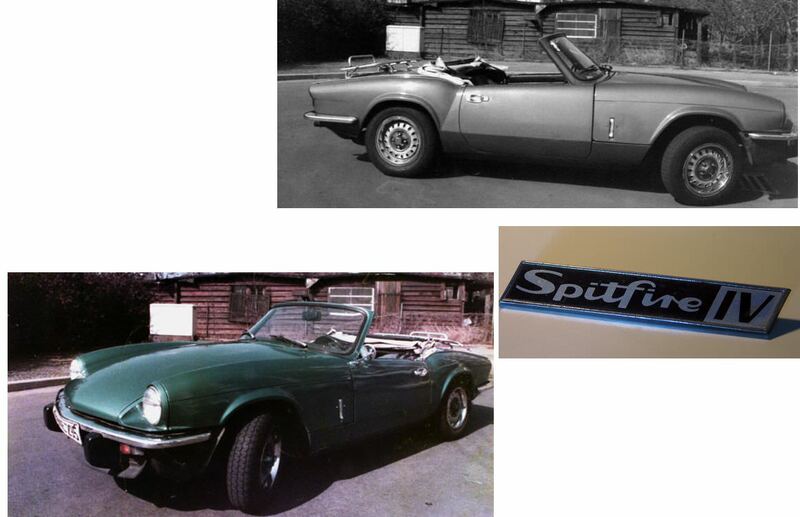 My brother had a 250 and his girlfriend (later his wife) had a Spitfire coupe. Both were 6 cylinder engines, and I maintained both cars for them. Those duel Stromberg carbs were a royal pain to keep properly in sync as were the SUs in the B, but both cars were easy to work on, and I did like the sync 1st gear. the fenders were two piece affairs with that chrome strip between the two, which was like a rust magnet. So I really spent time keeping that area highly polished to repeal any water. Gotta thank you for bringing back more wonderful memories of better times. Yeah - tartan red with a red interior (it's one of the options listed in the link above) would be a bit overkill. "A pimp's car"! I love it! I have to say, though, my old Moggy was claret/burgandy with a red interior and that worked OK - and I seriously doubt that any pimp would be seen dead in a Morris 1000! Your mention of Ferrari reminds me that one of my favourite cars as a kid in the '60s was the Berlinetta (I had a Corgi toy of it). So, if I don't totally screw up the MGB and the "car kit bug" really bites, that would be a fun build. But before I do that, I've remembered I have something of a monster in The Stash! The Academy/Minicraft 1:12 1936 Mercedes Benz 540K. I picked it up for a song when a model shop chain (Beatties) closed down in 2001. I think it's probably a re-box of the 1970s Gakken kit. Anyway, that's definitely something for the future. I won't let it distract me. That is a gorgeous Spitfire! I always loved that car when I was a kid (although I could never understand why there wasn't a Hurricane to go with it...). The closest I ever got to either the Spitfire or MGB was the bass player in our band's MG Midget back in the early '80s. He was rather shorter than me and had no trouble with it, but I really struggled to squeeze my legs in. There was no way I could have driven it for long without risking a serious attack of cramp! It was a great little car, though - masses of character. A Morris 1000. I don't recall ever seeing one on the road. Sure hope it was at least a sporty two door Coupe rather then the 4 door Sedan. Love to see you tackle the 1936 Mercedes 540K in 1/12 scale. it certainly would be a fantastic build one doesn't get to see these days. Of course, anything in Italian Red with the name Ferrari on it, will turn an enthusiast's head in a nano second. Actually, it was a Traveller (a British poor-man's take on the Ford Woody). Same colour as this one, but with a red interior. I loved it - it was a real workhorse and could carry a ton of gear, but it was a bit hairy if the back end got away from you with a heavy load. The best skid I ever had was in the Traveller, despite its lack of power! Actually, that struck me the other night when driving a modern car - I was about to back off going around a windy country lane when I realised the car was sticking to the road like glue! So, I suppose there's something to be said for progress, even if modern cars don't have one iota of the character of the old ones. A woody. Now I'm impressed. Yep, today's cars are marvels on the road. they're 10 years ago F1 technology. I never thought I could drive a 5 speed, but my Coupe is a 6 speed, ABS braking and traction control. Now that's living. Ha - this is turning into a whole " 7 degrees of separation " bit. You are building an MGB - my sister and Joel each had one - You had a Morris Traveler - My older brother had a college buddy in the 60's with one . I was about 10 yrs old at the time. 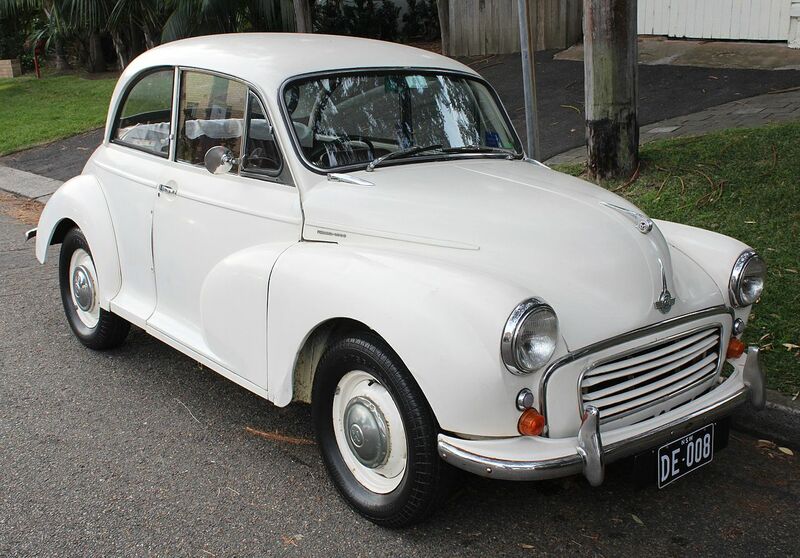 One night there was a knock on our door - a police man said there had been an accident- my brother and his buddy were a little beat up but otherwise OK - they rolled the Morris 3 times in a display of youthful machismo- no seat belts either back then ! My brother briefly attended a very good art school in Philadelphia -I played guitar for a bit and my brother would occasionally bring a friend home who was a fabulous finger style guitar player - he taught me Travis style and he later went on to play bass with The band " Nazz " ( with Todd Rungren maybe ? ) . Years later my father in law became interested in Model railroading. While thumbing through one of his magazines I came upon an article by this same guitar player who was now an avid model railroader and worked for Walt Disney . As a side note a fellow would occasionally show up at my brothers art school and sit on the cafeteria floor and strum a bit - his name was Bob Dylan . This is turning into one of the best ever threads on Kit Maker Network. Guys, keep the memories coming. And to think it's all because Rowan is building a MGB. Richard, those are great memories for sure. Bob Dylan singing and playing guitar while sitting on the floor. And the coincidences continue; I'm reading "Positively 4th Street: The Lives and Times of Joan Baez, Bob Dylan, Mimi Baez Fariña, and Richard Fariña" at the moment. And, would you believe it... Bob Dylan's favourite car was a souped up Morris Traveller! Actually, don't believe it - I just made that last bit up. I won't get a day off work this week because my deputy's on holiday, but I hope to actually make a start on the MGB before long. Sorry for the total no-show after my excitement at the prospect of this build! But my deputy is back now, so to get a chance to start at least. So I have a funny MGB story, and this build brings back a lot of memories. Way back in 1967, my brother worked for Westlake Motors here in Seattle. They sold MGBs, as part of their Foreign car line. I was 14 at the time, and itching to drive. One night he brought an MGB demonstrator home--my parents were gone out for the evening, and we lived on a 1.5 acre farm of sorts, which was interspersed with large fir trees at intervals throughout the farm and garden areas. His MGB was British Racing Green, with a cream or white pinstripe as I recall. After my parents left, and darkness fell, my brother said "come on, no ones looking, I'll let you drive the MGB!" I thought he meant on the street, but he wasn't that brave-- so we confined the driving to the garden, yard and driveway! I was all "over the road" so to speak, and narrowly missed hitting several of those fir trees, but we had a blast. That is until the next morning when my Dad looked out into the yard and garden and saw MGB tracks all over. After that, MGB driving in the yard was strictly forbidden! Have fun on this build, I'll be following along. Glad to see that you're going to start your epic MGB build. Well, I've finally got a day off work and took the opportunity to do a test fit of the main parts and do an overall assessment of the job ahead; suffice to say, it'll be fun - but it won't be quick! The body and chassis can be bullied into fitting together, but the fit isn't great and there's a lot of clean-up needed on every part. There are sink marks and mould-separation lines all over the place, plus the surface of the body has a nice mix of lumps and nicks to level out. The biggest shock, though, is that the instructions are hopelessly optimistic - virtually a recipe for guaranteed disaster. So, I'll basically ignore them totally and build the beast in a sequence that will allow me to sort out the fit and finish (hopefully) satisfactorily. So, I can tell there's going to be a lot of prep-work to put in before I can show any progress, but at least I now know the scale of the task ahead. Neat Rowan. I've got one in the stash that I too picked up at a resale kids clothing shop. I'll have to reread this one in detail before I start. My mom had the 1974 1/2 MG, with the rubber baby bumpers, in screaming yellow. Don't remember the tail being jacked up, but it was difficult for 20 something year old me to get in and out of. She had it repainted at some time in a proper British Racing Green. IIRC they had it hauled away on the 2000's when the mechanic told 'em it was too expensive to fix and my sister's offensive lineman sized son wouldn't fit behind the wheel. Rowan - I'm glad to see you making a start but I am actually quite surprised. After reading your lustful review of CSM's 1/32 Nieuport I was certain the MGB would be put way on the back burner ! Admirable self restraint but I bet you toss and turn at night in a sweat with Nieuports buzzing around your head !